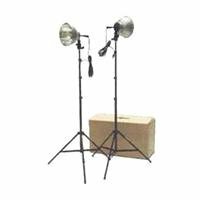 RPS Studio RS-4002 1000 Watt Two Light Kit features a high tech design gives the reflectors in this kit a big quality improvement over older style reflectors that have been on the market for years. This new design eliminates concentric circles and hot spots resulting in vastly improved light quality and thus, final picture quality. Additionally, each reflector in this kit is designed with durability in mind. The sockets are ceramic, rated to 660 watt reducing the chance socket failure due to overheating, even with 500 watt bulbs. The on/off switch is in the UL/CSA 2 wire line cord, away from the heat of the socket. The socket is designed to move smoothly forward and backward in the reflector giving the photographer greater artistic control over the light width and edge sharpness.Each reflector bayonet mounts to the ceramic socket for a secure fitLess Thanno more stripped threads. The socket mounts to the light stand via a secure umbrella adaptor that locks the head securely in place. One additional feature of the reflector is the ability to accept umbrellas.The 4-section steel light stands in this kit are black to help prevent reflections and rise to 7 ft. 2" (86") with a 3/8-5/8 spigot with 1/4-20 male thread and feature secure flip locks. Each stand closes to 24" for easy transport. Locks are spring-loaded screw locks ensuring positive locking for each section. It also includes travel and storage box.